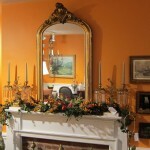 Mirrors are quite simply the most useful yet underappreciated decorating tool readily available to all. We happen to love using them in almost every of room of the house and often using more than one in a living room, parlor, dining room or hallway might be just what we recommend. 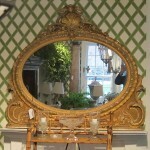 While a particular frame might lend you to believe that the mirror is intended for a certain type of décor, most mirrors are actually very timeless and versatile and will blend very well with any interior. The frame itself might just add that hint of balance or experimentation with another style of décor that you have been attracted to. Since wall mirrors are wonderful for reflecting light, creating depth and opening up a space, we always suggest using a mirror in small and medium sized spaces. Don’t be afraid to use a large mirror, even in the smallest room powder room. Just remember to always make its positioning count by reflecting a nice view or a lovely piece of furniture.